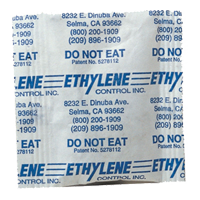 Ethylene absorbing sachet to protect your bulbs in the fridge from ethylene gas released by fruit and vegetables. Simply place one sachet in the paper bag with your bulbs - lasts up to two months. They're also great for making your fruit and veges last longer as the ethylene gas makes them ripen faster too.